VIP Private Tour departing from Bangkok, Thailand. Siam Winery is located in Samut sakorn, Thailand. They offer a memorable experience of Thai wine-making process, where you can learn more about the process of making Thai wines through our tour and demonstration vineyard. Enjoy your visit with lunch, wine tasting and learn more about Thailand award winning Thai wines. 10:00 Arrive Siam Winery; at the winery you will enjoy a welcome drink and an introduction to the winery by one of their staff. Tour the Production Line, Siam Winery is the largest producer of wine cooler in Thailand and here you'll have the chance to see the total process. Presentation on the Thai Wine Making Process and tour the Thai wine making facility and includes a tasting of the Thai wines from the barrel. Siam Winery was established in 1986 by Chalerm Yoovidhya with a strong vision to offer consumers wine as a healthy alcoholic drink. Our state-of the-art winery is located in Samut Sakorn, 30 miles south west of Bangkok and we cultivate over 300 acres of our own vineyards, that includes a wine tourism and education center in its Hua Hin location. 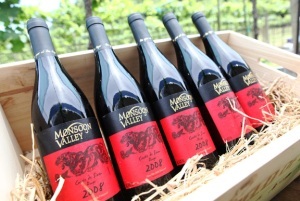 Siam Winery has become South East Asia's leading wine company with a total of over 1000 employees. The portfolio includes locally produced fine wines and wine beverages as well as a distinct range of imported wines and premium beverage brands from around the world. 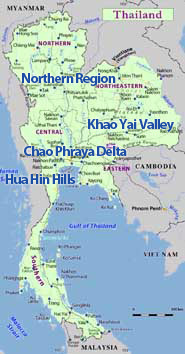 Situated in the Chao Phraya Delta (60 km south west of Bangkok) between the Tacheen and Meklong Rivers by the Gulf of Siam. Here, vines are planted on islands, separated by canals which is a signature characteristic of this area. This is the last stage before the slow and relatively lengthy ageing process. Wines are bottled in a sterile environment, and sealed with a cork. At Siam Winery, the air is removed from the bottle's headspace immediately before the cork is inserted.